When did the surfer/frat-boy slang term broham come into existence? I feel as if I may have heard it back in 1987 when I spent a summer in California, but I’m not sure. 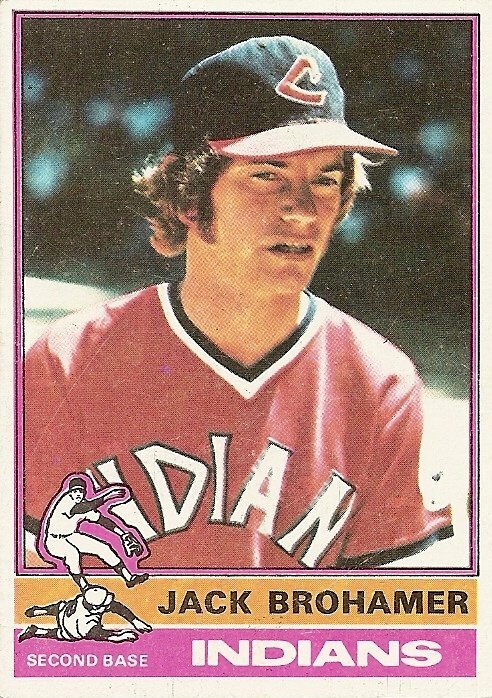 Anyway, I wonder if utility infielder Jack Brohamer would have been more well-known if the term had been around in his day. As it was, Brohamer came and went without leaving much of a trace. He played for a few years in Cleveland, his only departure from anonimity coming in his role as the unwitting Archduke Franz Ferdinand of the 10-Cent Beer Night riot (as mentioned previously on Cardboard Gods, Len Randle’s hard slide into Brohamer at second base in Texas led to a beaning of Randle, which led to a fight and the pelting of Indians players by Texas fans, which led to a night for the ages on the Rangers’ next trip to Cleveland). He went on to play two years for the White Sox, the most stunning legacy from that era the fact that in 1976 Brohamer was intentionally walked 9 times (the player who most often followed him in the lineup was named Bucky Dent), then played for the Boston Red Sox for a couple years before returning to Cleveland for one more brief and inconsequential go-round. The closest he ever got to the playoffs was when he started at third base for the Red Sox in the 1978 one-game divisional play-in game against the Yankees. Brohamer had been having an excellent season as a part-time player for most of the year, his batting average over .300 as late as July 9, then after a slump climbing back to .270 by August 28, when the Red Sox held a 7½-game lead over the second-place Yankees. From that point on, however, Brohamer, forced into playing nearly every day by injuries to second baseman Jerry Remy and third baseman Butch Hobson, collected just 10 hits in 69 at bats for a sickly .145 batting average. But nobody blames Jack Brohamer for the collapse. In some ways I’ve always aspired to this level of culpability in my life. I don’t want to be held responsible. I don’t want anyone cursing my name. Better to just stick to the sidelines, the shadows, and let someone else get the glory or take the fall. Better to just Brohamer it. Meanwhile, I live vicariously through game-playing strangers, drawing as close as possible to them in my imagination in their times of triumph, and distancing them as much as possible from me with curses and even hatred when they stumble. You are currently browsing the archives for the Jack Brohamer (Cle.) category.